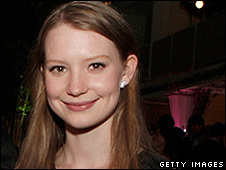 Australian actress Mia Wasikowska is in final talks to star in director Tim Burton's Disney version of Alice in Wonderland, according to a report. The 18-year-old is set to land the role after a long search for the title character, the Hollywood Reporter says. The actress started out in Australian TV drama All Saints and stars in US series In Treatment. She also appears alongside Daniel Craig in war drama Defiance, due out later in the year. Burton's take on Lewis Carroll's classic fantasy novel will use a mixture of live action and animation and will be made in 3D. Filming is due to begin in November, the Hollywood Reporter said. Wasikowska has just finished filming her role as a young fan of aviator Amelia Earhart in Mira Nair's biopic Amelia, starring Hilary Swank and Richard Gere. Burton's previous projects include musicals Sweeney Todd and Charlie and the Chocolate Factory.